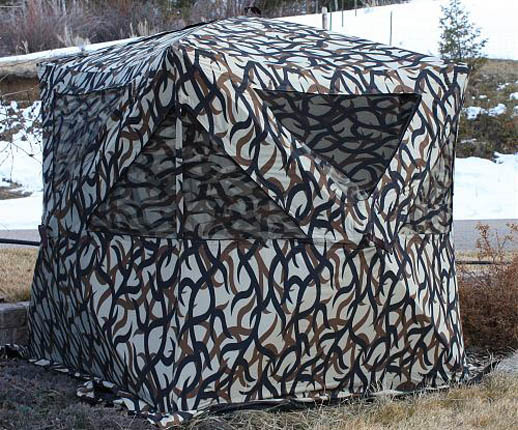 No UV Brighteners in ASAT Reaper Ground Blind! Free 3-5 Day Shipping in the USA on orders over $50. $5 flat rate shipping for $50 and under! If you are combining ASAT orders with another product purchase and PayPal charges you for shipping, let us know and we will refund the shipping (for over $50) immediately! Email us (bottom of this page) with your address and products to be ordered for the cost of 2 day shipping option. For shipping costs outside the US, please email us with your address and items you want to order. We will respond with the total cost, including shipping. If you want a quick list of ALL ASAT products with descriptions and our pricing, click here. Feel free to call us 406-431-0876. Announcement! New ASAT Blind Coming Soon! Sorry, the original blind is out of stock. Replacement Mesh Window for the ASAT Reaper Ground Blind.